While August days are typically hot and sunny, the temperatures in Montana are known to run a wide range and can drastically change from day to day (like 40 or 50 degree swings! ), so when the temperature drops in the Flathead Valley I enjoy to get off the lake and spend a day exploring. Aside from Bigfork, my favorite town in the region is Whitefish, so on a cool Thursday afternoon we swapped our swimsuits for sweaters and made the short drive up. Situated thirty miles north of Flathead Lake and thirty miles west of Glacier National Park, Whitefish is a western playground. 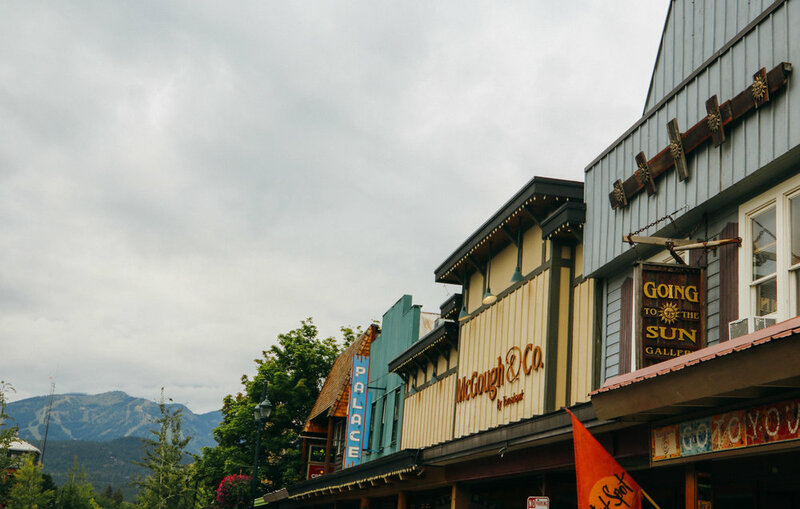 Between world-class skiing in the winter, pristine glacier waters for boating in the summer, to hiking, golfing, shopping… the town offers something for everyone! I enjoy spending a day strolling down Central Avenue and its neighboring streets, window-shopping and taking in the gorgeous surroundings. Downtown Whitefish exudes charm and class. With touches of a European village mixed with the Old West, it's a town right out of a movie. High-end art galleries and recreational outfitters rubs shoulders, creating a unique blend of sophistication and adventure. The culinary scene is quite strong, offering a wide variety of cuisines at every price range and atmosphere. As a Montana girl who spends her summers in the Flathead Valley, I have spent a fair share of time in Whitefish and look forward to each opportunity I get to visit. If you ever find yourself in the area, below is a handful of my favorite shops, restaurants and activities that I highly recommend you check out. Whether just for a few hours or a full week, you won't be sorry you made the trip! Inspired by the grand lodges of the past, with all the conveniences of the present, The Lodge has returned a sense of leisure and grace to the Montana travel experience. Situated on stunning Whitefish Lake and just minutes from Big Mountain Ski Resort, The Lodge is the perfect location for your Northwest Montana vacation. For a true taste of the East Coast, head to Jersey Boys for a slice of New York style pizza in a casual, laid-back environment. If you're in need of a caffeine fix, Montana Coffee Traders is the place to go! They have numerous shops located around the Flathead Valley. My personal favorite drink: The Jitterbug! With stunning views of Whitefish Lake, the Boat Club Restaurant at Whitefish Lake Lodge is the perfect spot for a laid-back lunch or dinner at sunset. For a tasty brunch, look no further than Loula's Cafe in the heart of downtown. Their "made from scratch" dishes using fresh and local products make Loula's a favorite with locals and visitors alike. Make sure you don't leave without having a piece of one of their specialty pies. If you have a sweet tooth like me, Red Caboose Frozen Yogurt is the place to go to satisfy a craving. Their yogurt is packed with natural goodness and the best part, the shop looks like a caboose! It's too cute. Meriwether's offers cheeky, unique gift ideas that are one of a kind and make for great souvenirs of your Montana travels. As a bonus, it's impossible to leave without a good laugh or two! The go-to shop for elegant, upscale Western wear that will have you looking like rodeo queen in no time. For all your Montana recreational needs, The Toggery offers a wide variety of the best outdoor brands. Whether you're in need of a beautiful bouquet or looking for a thoughtful gift, this charming shop will brighten up your day. At its core, Whitefish is a ski-town whose world-class slopes are sought after in the winter months. In the summer months, the mountain turns into an outdoor enthusiast's playground offering everything from hiking and mountain biking, to zip line tours and an aerial adventure park (a suspended obstacle course in the trees!). Boating, kayaking, swimming, fishing and even flyboarding (check it out if you don't know what it is!) are just a few of the activities offered on Whitefish Lake, a gorgeous 7-mile-long glacial lake. Plus, the lake is rarely windy so it provides ideal conditions for water-skiing. One of the best parts about Whitefish is that it's located just thirty miles south of the 'Crown of the Continent', Glacier National Park, which make day trips in-and-out very convenient.